Doug Doppler - Founder of the soon to be released "Get Killer Tone" DVD Series. Doug is signed to Steve Vai’s Favored Nations label and he is a certified Guitar Hero. Doug’s tracks can be heard on Guitar Hero Encore: Rocks the 80’s (2007) and Guitar Hero on Tour (2008). Doug Doppler Instructional DVD lessons are available at GUITAR411.com. To learn more about Doug Doppler, the Get Killer Tone DVD Series and GUITAR411.com check out the "Credits" section at the bottom of this page. Doppler's good friend Joe Satriani, who is an ARACOM PRX150-Pro customer; has had great things to say about the product and recommended the attenuator to Doug. 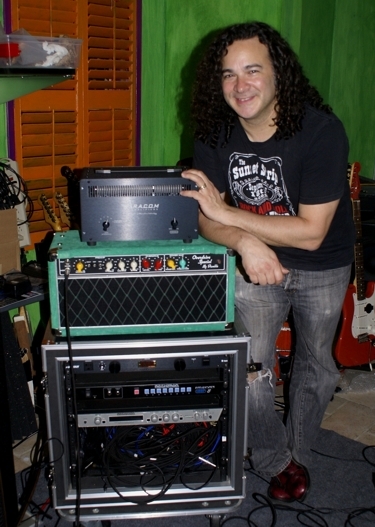 Doug is using the PRX150-Pro with a large variety of amplifiers and cabinets for the "Get Killer Tone" project and has graciously provided us with a number of audio clips. The clips features a small sample of the gear that will be showcased in his "Get Killer Tone" DVD Series. Doug Doppler's "Get Killer Tone" DVD series. Audio clip #19, an original Dumble Steel String Singer with the PRX150-Pro. Clip 19: Don Grosh ElectraJet > Vintage TS808 (melody/solo) > original Dumble Steel String Singer > PRX150-Pro (4 to 16 ohm conversion) > Avatar 1x12 open back cab loaded with a Scumback M75-HP-LHDC > Royer 121 > Avalon M5 mic pre > Pro Tools. Clip 1: Ibanez S7320 Guitar > Blackstar Artisan 100 watt amp (Volume on 10), Hi input, bottom inputs jumped > PRX150-Pro (Variable Attenuation Mode), Line Out to > Boss DD-20 Pedal (on melody/solo track only) > Carvin Legacy 2 head effects return > Legacy 4x12 cabinet > Royer 121, AEA R92/TRP > Pro Tools. Clip 2: Nash Tele > Wampler Ecstascy Pedal > Fender Twin II amp > PRX150-Pro, B attenuation setting (-6dB) > Orange 2x12 cab > Royer 121 > Pro Tools. The PRX150-Pro was used to impedance match the Fender Twin II's 8 ohm output to the 16 ohm Orange cabinet. Clip 4: EVH vibe = Gibson Les Paul > Wampler Triple Wreck Pedal > Wampler Faux Tape Echo Pedal > Fender Twin II amp > PRX150-Pro, B attenuation setting (-6dB), 8 ohms in, 16 out > Orange 2x12 Celestion Vintage 30 loaded cabinet > Royer 121 > Pro Tools. Clip 5: Gibson Les Paul > Wampler Triple Wreck Pedal > Wampler Faux Tape Echo Pedal > Fender Twin II > PRX150-Pro, B attenuation setting (-6dB), 8 ohms in, 16 out > Orange 2x12 Celestion Vintage 30 loaded cabinet > Royer 121 > Pro Tools. Clip 6: Ibanez AFS75T (hollow body guitar) > Sonic Edge J&J Overdrive > AnalogMan modded Boss DD-3 > Matchless Clubman amp> PRX150-Pro, D attenuation setting (-12dB) > Orange 2x12 Celestion Vintage 30 loaded 2x12 open back cabinet > Royer 121 mic: left side, AEA R92 mic>TRP: right side > Pro Tools. The PRX150-Pro was used to impedance match the Matchless' 8 ohm output to the 16 ohm Orange cabinet. Clip 7: Nash Tele > Sonic Edge J&J Overdrive > AnalogMan modded Boss DD-3 > Matchless Clubman amp > PRX150-Pro, D attenuation setting (-12dB) > Orange 2x12 Celestion Vintage 30 loaded 2x12 open back cabinet > Royer 121 mic: left side, AEA R92 mic>TRP: right side > Pro Tools. The PRX150-Pro was used to impedance match the Matchless' 8 ohm output to the 16 ohm Orange cabinet. "The PRX-150-Pro came with the highest recommendations, but it was the long hours in the studio that really sold me on this unit. In addition to taking the most brutal amps down to talking volume with unbelievable transparency, the head:cabinet Ohm matching capacity is invaluable in getting heads to run at the ohm setting where they were designed for. Further, I don't have an isolation booth, and for home recording this unit has made this process totally manageable for all amps. The "B" attenuation setting is just enough reduction to allow you open the throttle on clean amps, but keep them at a level where you can track with phones on and not fight the volume of the amp in the room. This unit with designed with excellent performance in mind, and at every turn it delivers just that! " 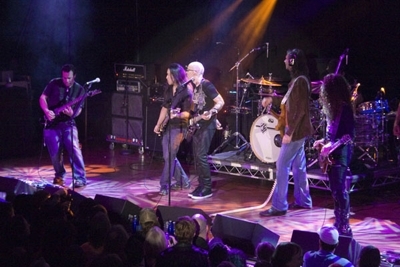 Doug Doppler on stage with: Joe Satriani, Herman Li, Paul Gilbert, and Marty Friedman. 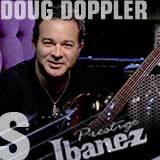 Signed to Steve Vai’s Favored Nations label, Doug Doppler is a certified Guitar Hero. Doppler’s tracks can be heard on Guitar Hero Encore: Rocks the 80’s (2007) and Guitar Hero on Tour (2008). On Tour is the first GH game to be released on the Nintendo DS platform, and sold a whopping 300,000 units the first week. Fast forward to 2009 and you can add Rock Band DLC (downloadable content) to the list of Doppler’s video game accomplishments. With one key difference – now gamers can rock out to “Grind” taken from “Nu Instrumetal”, Doppler’s Favored Mations release. When Doppler is not in the studio he spends his time on the road touring as the support act for the likes of Gilby Clarke (Europe 2006) and Michael Schenker (US 2007, 2009). Doppler’s travels an international artisclinician for Ibanez guitars have taken him to Italy, UK, Australia, New Zealand, and in 2008 a clinic tour across mainland China. A former pupil of guitar guru Joe Satriani, Doppler inherited the Berkeley, CA teaching studio where Satch also taught the likes of Metallica’s Kirk Hammet (whom Doppler referred), Testament’s Alex Skolnick, and Primus’ Larry LaLonde. Keeping in his teacher’s footsteps Doppler has taught thousands of people the art of guitar mastery and continues to do so via his internationally acclaimed Guitar 411 instructional DVD series. Look for the 2010 release of Get Killer Tone. Doppler’s press accolades cross the globe and include Guitar World, Guitar Player, Guitarist (UK), Australian Guitar, Guitarre Live (France) and Guitar Club (Italy). Go to www.dougdoppler.com to check out more information. "I created Guitar 411 so I could reach guitarists beyond the immediate area of the Berkeley, CA teaching studio I inherited from my mentor Joe Satriani. We all are called to do something with our lives and teaching is something I still love to do in addition to making records and touring (please visit my site for more info). My method draws upon the 3 1/2 years I spent studying with Joe, the year I was at GIT, and 20 years since then teaching SO many students. I take what I do seriously as the chances are you love the guitar every bit as much as I do, which means I have a huge responsibility to make the most out of the experience for both of us. The better my students get, the better I become as a teacher, and in turn the better the experience is for each of us!"